How do you brand a magazine to work both online and in print? 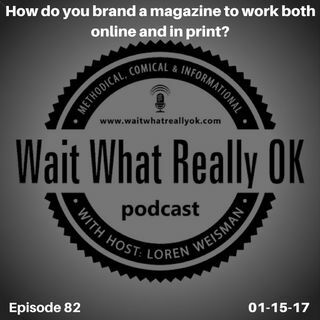 Wait What Really OK Podcast Episode 82 hosted by Branding Strategist and Keynote Speaker Loren Weisman shares his views on print media and how to maintain momentum and profit with online and physical applications of a magazine. The biggest mistake that is made in print media today is the sharing of media everywhere at the same time. But it is key and crucial to not copy all media. If it is all available online, then why should ... Más informaciones anyone buy the print and at the same time, if it is only in print, how will people find out about it online. There is a happy medium that can cross promote as content cross pollinates and supports each element in different places. This array format allows for a better chance of exposure, connection and conversion to subscribers and profit. Episode 82 “How do you brand a magazine to work both online and in print?” of the Brand Management and Marketing Podcast Wait What Really OK is available on iHeartRadio. Podcast Blog Supplement for Episode 82 of the Wait What Really OK Podcast with Loren Weisman. Podcast Link Supplement for Episode 82 of the Wait What Really OK Podcast with Loren Weisman. Just because it is not exciting to you does not mean it is boring. Podcast Video Supplement for Episode 82 of the Wait What Really OK Podcast with Loren Weisman. Podcast Photo Supplement for Episode 82 of the Wait What Really OK Podcast with Loren Weisman.